We explore the concept of a sparse peripheral display, which augments the field-of-view of a head-mounted display with a lightweight, low-resolution, inexpensively produced array of LEDs surrounding the central high-resolution display. We show that sparse peripheral displays expand the available field-of-view up to 190º horizontal, nearly filling the human field-of-view. 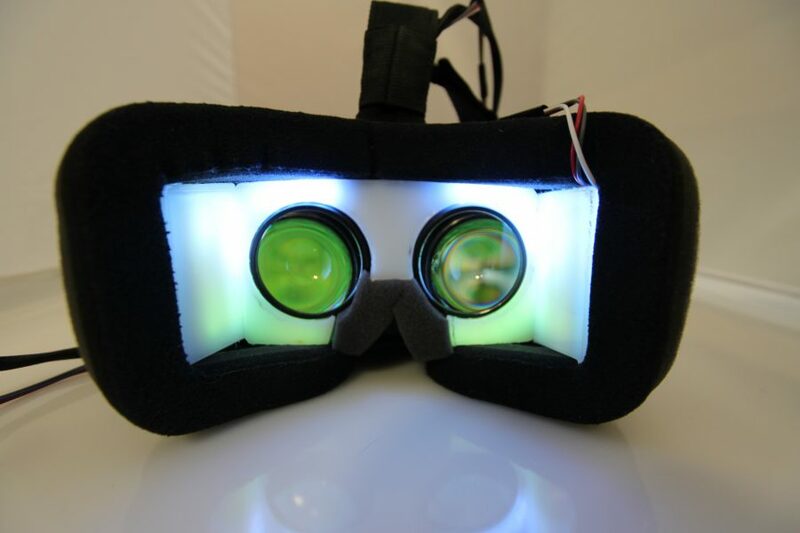 We prototyped two proof-of-concept implementations of sparse peripheral displays: a virtual reality headset, dubbed SparseLightVR, and an augmented reality headset, called SparseLightAR. Using SparseLightVR, we conducted a user study to evaluate the utility of our implementation, and a second user study to assess different visualization schemes in the periphery and their effect on simulator sickness. Our findings show that sparse peripheral displays are useful in conveying peripheral information and improving situational awareness, are generally preferred, and can help reduce motion sickness in nausea-susceptible people. Xiao, R., Benko, H. 2016. Augmenting the Field-of-View of Head-Mounted Displays with Sparse Peripheral Displays. In Proceedings of the 34th Annual SIGCHI Conference on Human Factors in Computing Systems (San Jose, California, USA, May 7 – 12, 2016). CHI ’16. ACM, New York, NY. 1221-1232.